Pre-1923 earthquake view of Tokyo Kaikan, c. 1920, with the Metropolitan Police Board at left. “This magnificent building situated in the central business quarter of the metropolis, is on of the foremost restaurants in Tokyo. It is noted for the excellence of its service and cuisine as well as for its rooms. Besides the magnificent dining hall there is a spacious de luxe Sukiyaki room on the 3rd floor. This room is big enough to hold the largest meeting. “The Tokyo Kaikan faces the Imperial moat, with overhanging pine trees reflecting on its surface, and close by are the famous Imperial Theatre, Tokyo Station and Hibiya Park. Rose Room (4th floor), Tokyo Kaikan, c. 1930. 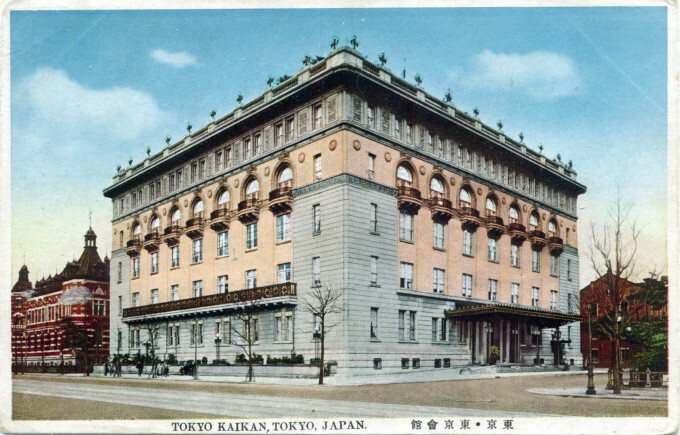 “One of the really handsome buildings which failed [in the earthquake] was the newly-completed Palace Hotel, known as the ‘Tokyo Kaikan’, a palatial structure of five floors designed as a high-class social and entertainment center, and erected at a cost of over ¥3,000,000. During the quake the brick walls of the entire second storey were shaken out, throwing the full strain of the heavy upper floors on the steel corner columns which bent under the repeated shocks. “For the past twenty months the building has been considered as dangerous but engineers have reported that it can be repaired and strengthened in such a way as to make it absolutely safe in the future. 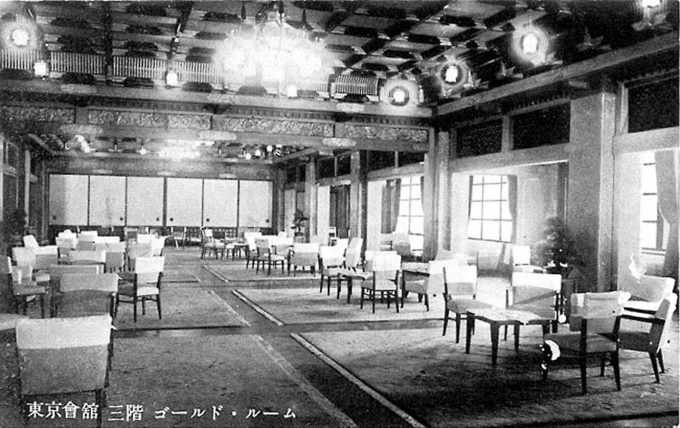 Gold Room (3rd floor), Tokyo Kaikan, c. 1930. 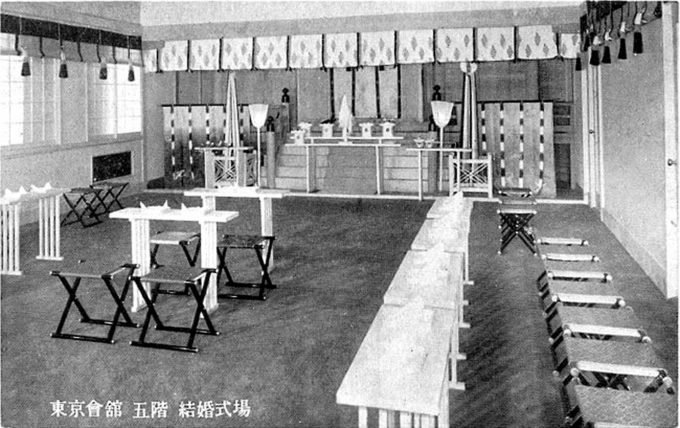 Wedding hall (5th floor), Tokyo Kaikan, c. 1930. Prunier Café & Rossini Grill (1st floor), Tokyo Kaikan, c. 1930. “Sukiyaki Room”, Tokyo Kaikan, c. 1930. The earliest Meiji-era “social” hall was called the Rokumeikan [deer cry pavilion], designed by English architect Josiah Conder. It opened in 1883 for the purpose of entertaining foreign diplomats and dignitaries, and was one of the earliest architectural symbols of Japan’s Westernization. In 1921 a grander hall, Tokyo Kaikan [meeting hall], was completed. 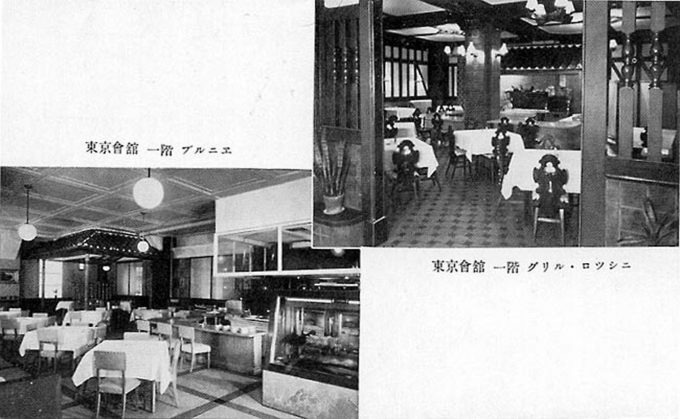 It was designed by Taniguchi Yoshiro (who also designed the Imperial Theatre and, after the Pacific War, the Okura Hotel). The opulent building faced the Imperial Palace and quickly became the favorite of the city’s corporate elite, with conferences, banquets and large-scale presentations. 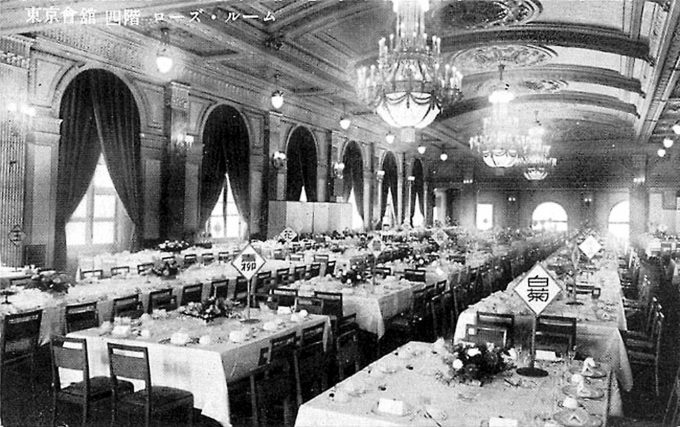 Inside were elegant banquet facilities and a wedding hall, and several of Tokyo’s first posh Western- and Japanese-style restaurants that were open to the general public. 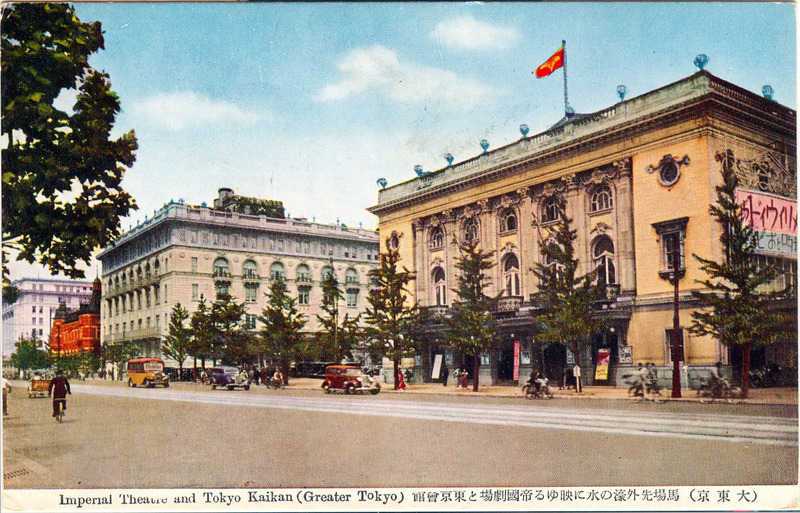 Tokyo Kaikan (left) and Imperial Theatre (right), c. 1940. 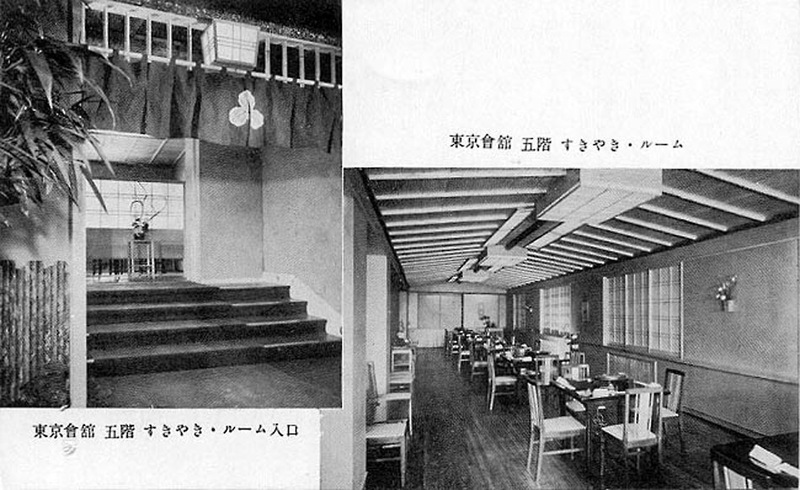 Both buildings were designed by architect Taniguchi Yoshiro. The building was one of many in the Marunouchi district to survive war-time B-29 firebombing raids. During the Occupation, the Tokyo Kaikan premises served as both a US military officer’s club (a block away from SCAP HQ) and as the location of the Tokyo American Club for expatriate businessmen. 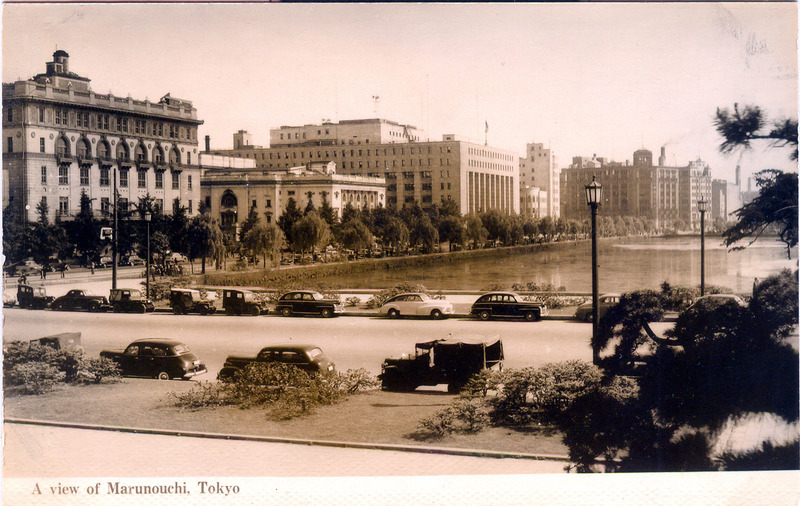 Tokyo Kaikan (left), Imperial Theatre, Dai Ichi Seimei Sogo (SCAP HQ) & the Metropolitan Police Board buildings during the Occupation era, c. 1950.